He calls himself "Brown Dynamite." You'll get a bang out of this! Designer Mohammad "Hawk" Haque has captured Rajesh Koothrappali here, his gentle earnestness obvious in this fantastic Big Bang Theory Raj Q-Pop Vinyl Figure. Standing about 3 1/2-inches tall. Trademark windbreaker and wide-eyed gaze included! 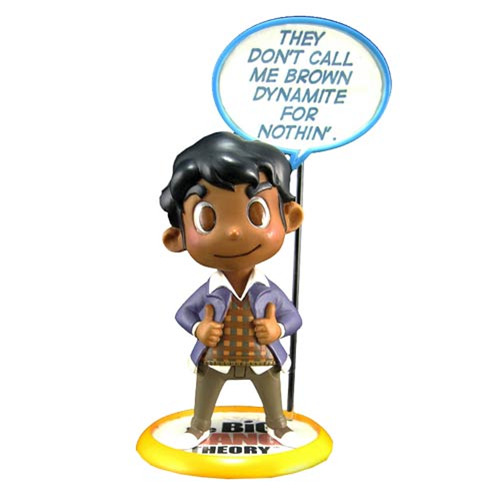 As with all Q-Pop figures, Raj comes with a word bubble and special marker, so that you can add quotes. Rajesh Koothrappali is one lovable paradox. He's a New Delhi native who dislikes Indian food and culture. He's a lonely, preening metrosexual who used to be unable to speak to women, unless he was drunk. He pleads poverty, but actually comes from a wealthy family. But he fell in love with astronomy while attending Cambridge University and aspires to be the male "Indira Gandhi of particle astrophysics."